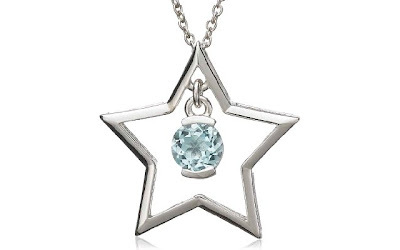 This Sterling Silver Blue Topaz Star Pendant Necklace is currently selling for just $16.99 on Amazon.com!! You will be saving 76% off the listed price of $66.99 with this jewelry deal. Also on sale right now is the Sterling Silver Peridot Star Pendant Necklace for $29.00! You will be saving 59% off the listed price of $66.99. What I like about this necklace is that it would be perfect for a girl as young as a tween all the way up to an adult. It would make a lovely gift for someone who really shined at school, on stage, or in sports.